Sous-genre : Inocybe (Fr.) Fr. Symptômes : Apparition rapide entre 30 minutes et 6 heures après l'ingestion, mais qui n'entrainent pas la mort. Kropp, Bradley R.; Matheny, P. Brandon, et al. Phylogenetic taxonomy of the Inocybe splendens group and evolution of supersection «Marginatae», Mycologia, 102(3), 2010, pp. 560-573, 14 p.
Kuo, Michael; Matheny, P. Brandon. Contemporary documentation of the rare eastern North American species Inocybe insignis (Inocybaceae, Agaricales), MycoKeys 11:23-31 (2015), 9 p.
Kuyper, Thomas W.. Begin eens met… Vezelkoppen (Inocybe) - 2. Voorlopige Determinatiesleutel tot de Knobbelsporige Vezelkoppen, Coolia 49(1): 11-17, 2006, 7 p.
Lecomte, Marcel. Vous avez dit P.D.A.B. ?, Bulletin de l’Association des Mycologues Francophones de Belgique 2014/07, p. 4, 1 p.
Matheny, P. Brandon; Moreau, Pierre-Arthur. A rare and unusual lignicolous species of Inocybe (Agaricales) from eastern North America, Brittonia, 61(2), 2009, pp. 163-171, 9 p.
Matheny, P. Brandon, et al. 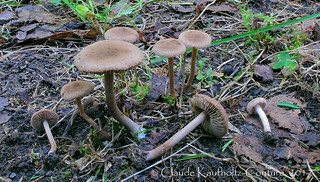 A common new species of Inocybe in the Pacific Northwest with a diagnostic P.D.A.B. reaction, Mycologia, 105 (2), 2013, pp. 436-446, 11 p.
Ferrari, Erminio. Inocybe alpine e subalpine Il genere Inocybe (Fr.) Fr. 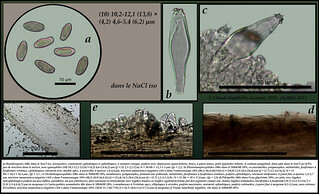 nel Nord Italia e paesi limotrofi, Fungi non Delineati, pars 34-36, Edizioni Candusso, 2006, 464 p.
Kuyper, Thomas W. A revision of the genus Inocybe in Europe I. subgenus inosperma and the smooth-spored species of subgenus Inocybe, Rijksherbarium, Leiden 1986, 134 p.
Murrill, William Alphonso,; Kauffman, Calvin Henry,; Overholts, Lee Oras, Agaricaceae (Murrill); Inocybe (Kauffman); Pholiota (Overholts), North American Flora, The New York Botanical Garden, vol. 10 part 4, 1924, 54 p.
Stangl, Johann. Guida alla determinazione dei funghi Vol. 3° Inocybe, Saturnia, 1e Edizione italiana, 1991, 437 p.